A big welcome to both first year and returning students on the first week of term! To mark the occasion we take a brief look into the early history of the University’s Highfield Campus. This postcard from the Cope Collection, at first glance a rather uninspiring view, provides an intriguing glimpse into the history of the Highfield Campus. It shows the first buildings on the Highfield site, which had been acquired by the Hartley University College early in the 20th century with the aim of providing premises more fitting to its ambitions than the cramped and inconvenient Hartley Institution in the High Street. Opened by Viscount Haldane in June 1914, the renamed University College of Southampton consisted of two separate wings housing an arts block and a range of single story laboratories for biology, chemistry, physics and engineering. Lack of funds meant that the construction of the administration and library building which should have filled the gap between the two arts wings was postponed. Occupation of the site was also postponed. 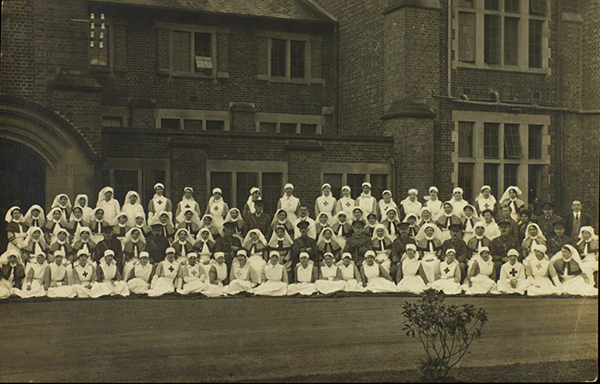 A few weeks after the official opening, the First World War broke out and the College offered the buildings to the War Office for use as a hospital. 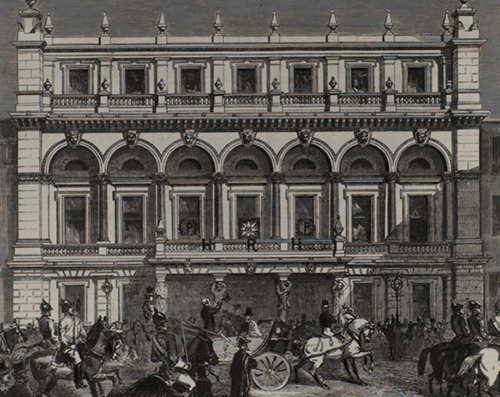 As the war progressed, the main building proved too small to accommodate the increasing number of wounded soldiers and extra wards were constructed in temporary wooden huts to the rear. In The University of Southampton as a War Hospital (1983) [Cope SOU 45] the author, Norman Gardiner, recalls taking cigarettes, fruit and sweets to the less badly wounded soldiers and seeing military gun carriage funerals passing along University Road. 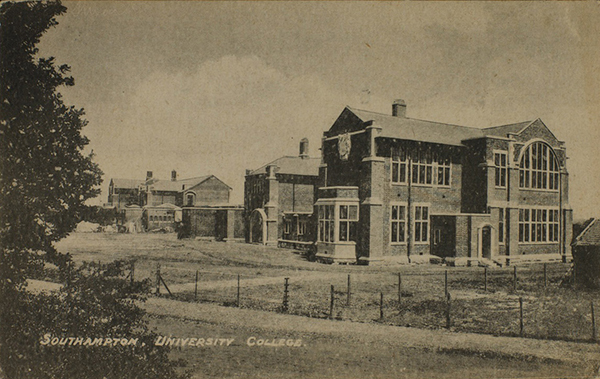 The War Office eventually gave up the buildings in May 1919 and University College of Southampton began the session of 1919-1920 in its new home, continuing to make use of the wooden huts – the refectory apparently occupying a hut bearing the sign ‘Dysentery’. 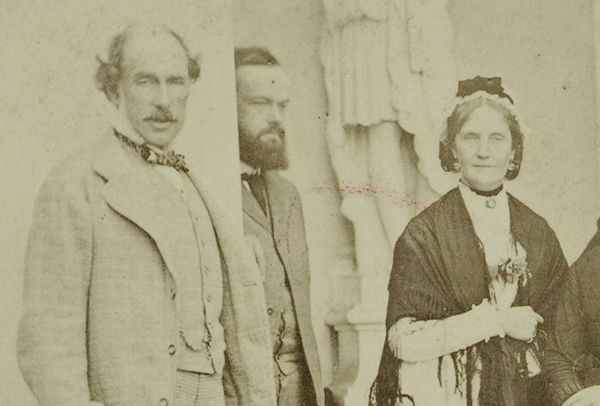 Financial pressures on the College meant that the completion of the central block had to wait until the 1930s when the construction of the Turner Sims Library was made possible by the donation of £24,250 by the daughters of Edward Turner Sims, a former member of Council. Much altered and extended since that date, the Library still awaits its tower. 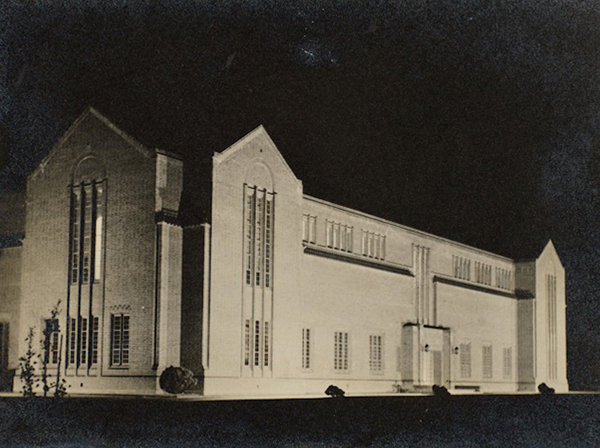 According to the programme for the official opening in 1935, this was intended to give dignity to the building and it was hoped it would be added in the not too distant future. The postcard is from the Peter Cook Postcard Collection, part of the Cope Collection on Hampshire and the Isle of Wight, a fascinating resource, of over 3,000 postcards of Southampton, most of which date from the early years of the 20th century. Today, 9 September 2015, Queen Elizabeth II overtakes her great-great grandmother Victoria to become the longest reigning British monarch. The 63 years that Queen Elizabeth has reigned have been ones of immense change and there have been 12 Prime Ministers, the same number of American presidents and 7 popes during this time. 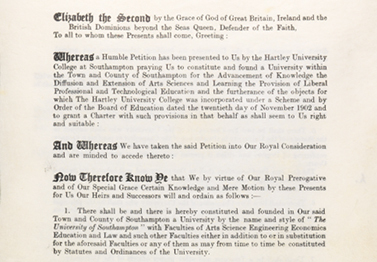 The University of Southampton has the distinction of being the first higher education institution to be granted university status in this reign, receiving its royal charter on 29 April 1952. The foundation institute of the University was the Hartley Institution, based in High Street, Southampton, which was opened on 15 October 1862 by the then Prime Minister, Henry John Temple, third Viscount Palmerston. 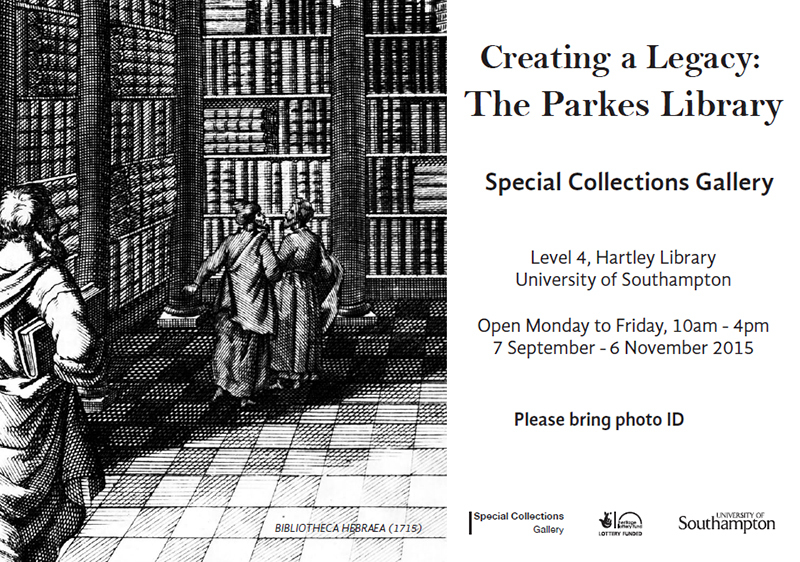 From modest beginnings, offering a mixture of public lectures on a range of subjects and evening classes in French and chemistry to residents of Southampton, as well as a reading room and a library, the Hartley Institution — and the University of Southampton — have grown into a multi-disciplinary, internationally renowned university of the twenty-first century. “Greetings from Exeter University College to the University of Southampton.